Fugitive Caracas mayor Antonio Ledezma, a key opponent of President Nicolas Maduro, traveled to Madrid on Friday after escaping house arrest in the Venezuelan capital. Ledezma, 62, had hours earlier crossed the border into neighboring Colombia, saying he intended to fly to Europe to organize resistance against Maduro’s rule, which has left millions of Venezuelans facing food and medicine shortages. The opposition leader boarded an Avianca flight from Bogota to Madrid, where he was scheduled to arrive early Saturday, airport sources at Bogota’s El Dorado airport said. 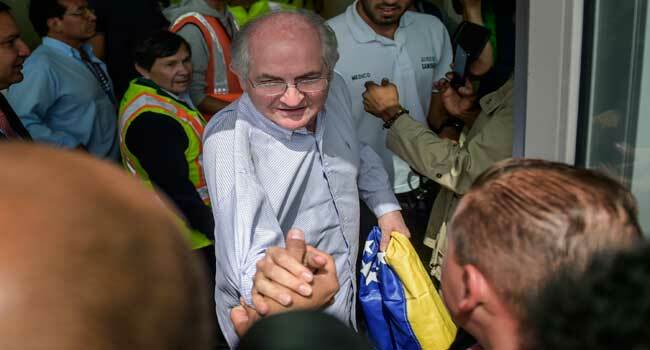 “My voice is joining a chorus of Venezuelans who have asked for help from Colombia,” Ledezma told reporters after arriving in the Colombian border town of Cucuta. Several Venezuelan magistrates have taken shelter in Colombia, including former attorney general Luisa Ortega, who is under government protection. He said his journey was worthy of a film, taking him past more than two dozen Venezuelan police and national guard positions before he was able to reach Colombia. However, he gave no details of his escape. Ledezma said he had fled Caracas because Venezuelan military and intelligence officials had informed him of a “government plan” against him, although he provided no details. “I don’t want to be a hostage to tyranny, to be used to subdue an opposition,” he said. The government in Caracas has made no comment on his escape. However, opposition leader Maria Corina Machado said Ledezma, whose wife is currently living in Spain, was at risk in Venezuela. “I know that his life was in danger because of the position he took firmly and coherently against this false dialogue,” she said, referring to talks between the government and the opposition. Ledezma has been critical of a planned new round of talks hosted by the Dominican Republic in December, after earlier efforts failed to get off the ground. He said he had conveyed his objections to the talks in a phone call with Colombian President Juan Manuel Santos, who has been a vocal critic of Maduro. Organization of American States chief Luis Almagro hailed the mayor’s escape. “My regards to Antonio Ledezma, moral reference of Venezuela, now free to lead the fight from exile, for the establishment of a democratic system in his country,” he wrote on Twitter. The mayor, a lawyer by profession, was arrested and jailed in February 2015 after being accused of plotting to overthrow the president. He had been under house arrest following surgery. He was elected Caracas mayor in 2009 and re-elected in 2013. Ledezma is a member of the Democratic Action opposition party, which was the biggest party in Venezuela before the arrival into power of Maduro’s predecessor Hugo Chavez in 1999.